Today marks the beginning of the end for the IRS’s “Tax Relief, Unemployment Insurance Reauthorization, and Job Creation Act of 2010.” Among other things, this act created a provision (Section 179) allowing companies to write-off up to $500,000 for modular construction on their taxes. Essentially guaranteeing the company will recoup their investment within the first year, the half-million dollar write-off will be lowered to only $125,000 after December 31, 2011. This leaves only six months for companies to take full advantage of this break by the IRS. These tax provisions were designed to encourage businesses to start spending, expanding, and hopefully create more jobs. If put to use in the same year it is built, modular construction now qualifies for single year depreciation thanks to these new tax breaks. Now companies across the US can expand their facilities and acquire new equipment with fewer worries about recovering the costs. Still considering stick-built? Consider this; a conventional stick-built structure must be depreciated over the course of 39.5 years, while a Panel Built storage solution can be depreciated over the course of 7 years. Even before taking the half-million dollar write off into account, a conventional stick-built project would have to be 32% less in initial cost in order to compete with a Panel Built product. With the short-term depreciation and tax write-off benefits of a Panel Built product, the time has never been better to build modular. However, because companies must put the new building to use within the year, the time to act is now. 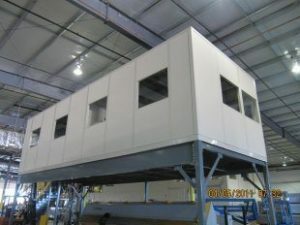 Panel Built Inc. has an experienced and knowledgeable staff that can design, manufacture, and construct a modular solution to fulfill your space needs.